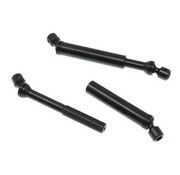 RedCat Racing (RER11415) Heavy Duty Steel Splined Center CV Shaft For Gen8 Scout II - ExcelRC.com - Michigan's best RC store! This part does not include the set screws! If you need set scres, you must order part number 13838. These CV Shafts are made from Hardened Steel, with 6 Splines. This part fits on a 5mm input/output Shaft.